Kyoto is a city with a long history – more than 1,000 years, in fact. The construction of its primary train station, Kyoto Station, took place during the city’s 1200th anniversary and opened to the public in 1997. Designed by acclaimed architect Hara Hiroshi, Kyoto Station is futuristic and modern. It is one of the largest buildings in Japan. 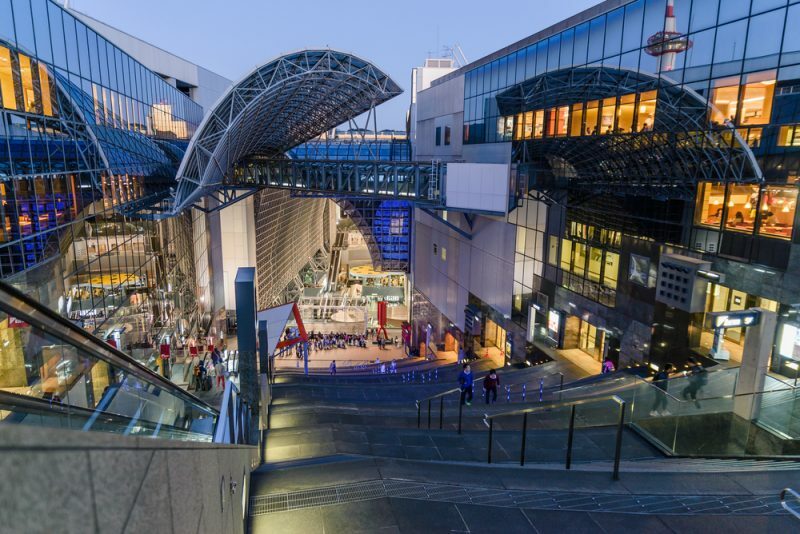 Filled with interesting restaurants, shops, and attractions, a visit to Kyoto Station is a miniature vacation in itself. Kyoto Station is the city’s most important transportation hub. Whether travelling with a Japan Rail Pass or using another railway company, you are likely to arrive at this station. Kyoto Station is served by the Tokaido Shinkansen Line, which connects to Osaka (in the section called Kyoto line), Nagoya, and also goes from Kyoto to Tokyo. It is located on the Hachijo side of the station. The Sanin Main Line, also called the Sagano Line, which connects to Saga-Arashiyama, the Arashiyama Bamboo Grove and the Sagano Scenic Railway. Other lines serving Kyoto Station include Kintetsu Railways, located on the Hachijo side, and Karasuma Subway Line, a municipal underground line. The station also houses a large bus terminal serving city buses, long-distance buses, and overnight highway buses. Kyoto Station is divided into two sides, the north and the south, with entrances on each side. On the north, the busy Karasuma side is named after the nearby street leading to downtown Kyoto. The main bus terminal is located on this side of the station, as is the Central or Chuo Gate serving the JR train lines. To the south is the Hachijo side, named for the adjacent street. The Hachijo houses the Shinkansen platforms as well as the Kintetsu Kyoto Station. On the second floor, a pedestrian walkway connects the north and south sides of the building. Another passage is located underground near the Porta shopping complex. If you utilized a luggage delivery service, you can pick up your belongings at the service counters in the basement level of the station. If you plan on getting around Kyoto and wish to leave heavy luggage behind, coin lockers are available throughout the station. Are you wondering what to do in Kyoto? 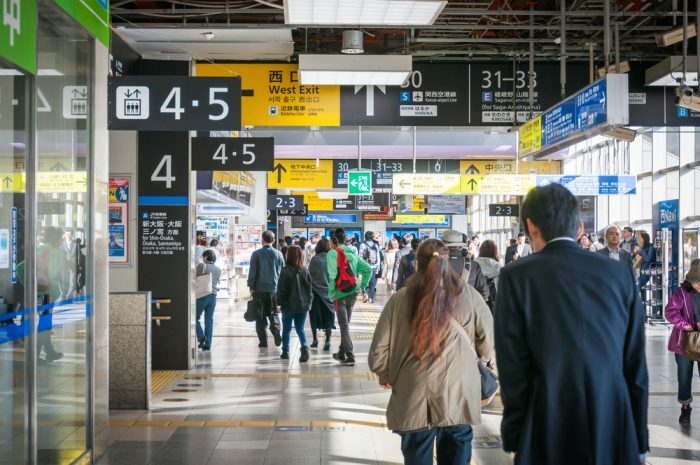 Why not stop by one of Kyoto Station’s Informational Centers? Speak with the multilingual staff of the Tourist Information Center on the station’s second floor, or visit the International Information Center on the ninth floor. In fact, you don’t even have to leave the station to experience Kyoto at its finest; the station’s 15 floors house shops, restaurants, a theater, an art museum, and even a hotel – the JR Hotel Granvia Kyoto located on the Karasuma side. Ten stories of the station’s western side are occupied by the JR Kyoto Isetan Department Store, providing shoppers with an array clothing, food, souvenirs, and more. An art museum is located on the seventh floor of Isetan. Beneath the bus terminal on the Karasuma side is the Porta Underground Shopping Mall, housing around 100 stores. Also on the basement level is the Cube Shopping Mall, featuring sweets, delicacies, and local souvenirs. On the 11th floor of the west side of the station, you will find the Cube Gourmet Street, which features nine restaurants all of which offer a different type of cuisine. Also, on the 10th floor, south of the “Daikaidan” Grand Stairway, you can find Kyoto Ramen Street (Kyoto Ramen Koji), a corridor full of delicious ramen noodle bars. Kyoto Station also offers free admission to its observation deck and Skyway. The observation deck is an open-air area on the top floor of the station, accessible by escalator. The Skyway is a tunnel that begins on the station’s eleventh floor and crosses 45 meters above the central hall. If exiting the station from the Karasuma side, you will find yourself amid a multitude of shops and hotels. You can also access nearby Kyoto Tower, the city’s tallest structure. If exiting from the Hachijo side, you will find hotels, malls, and highway bus stops. You can also access the Toji Temple, a UNESCO World Heritage Site founded in the late 700s. On your next trip to the historic city of Kyoto, you are sure to enjoy your time in Kyoto Station. Don’t forget to have your JR Pass in hand. Can I buy round fare tickets from Osaka to kyoto / Kyoto Osaka in your web page for the bullet train, and pick them up at the Osaka Shinkansen station? I believe they cannot be delivered to Guayaquil Ecuador, or can they? Hi Angela! 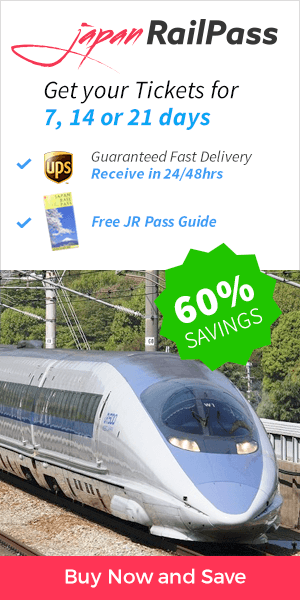 In http://www.jrailpass.com we do only sell Japan Rail Passes. Regarding the passes, we do ship them worldwide. Happy travels!